Character we've written about before + body we've written about before = perfect excuse to do a shorter review on the blog! This symbiote can bring pain or heal disease. And all of that power is under Eddie Brock's control. Not anymore it's not! Through a long, convoluted process, Eddie Brock lost those powers and became Toxin, so this figure represents the past! It's the equivalent of getting Commander Rogers after he was already back to being Captain America. Other than the head, this figure uses the same molds as Toxin: Hyperion body, but with big sharp claws and pointy elbows. The head actually looks very much like Toxin's - beady eyes, really long jaw, etc. - but it's definitely a new sculpt. Not only does Anti-Venom have small symbiote-spikes coming off his head, his teeth are an entirely different shape than Toxin's. His eyes and the inside of his mouth are painted a yellowy orange, contrasting well with the black around them. The toy does share Toxin's flaw of being way too smooth for the character, and also shares Toxin's solution to that problem: a little piece that plugs into his back. Woo. His is pointy, not curly, but it covers up quite a bit of the spider logo on his back. Disappointing! The Build-A-Figure piece included with Anti-Venom is Hobgoblin's right leg. It's surprisingly short, has three round silver buckles on the outside, and is otherwise all done in shades of blue. As far as Anti-Venom goes, the Marvel Select version is better than this one. So get it instead. 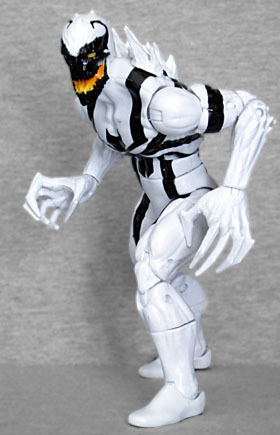 But if you want the BAF piece, take heart: despite the fact that the Anti-Venom symbiote was destroyed, someone was seen wearing it (or a reasonable facsimile) in the recent Hobgoblin miniseries, so maybe the nicely detailed MS figure is Eddie, while this smooth ML version is the imitator. Considering the sheer amount of Spider-Men seen in "Spider-Verse", I wouldn't be shocked if the new Anti-Venom was Peter Parker from a universe where he kept the Alien Costume but was able to redeem it. That's a pretty clever idea! He's Bizarro-Venom! He does everything backwards from regular Venom! I also wanted to say that I really like this short review in the blog post format because it allows for comments. I know you guys have a forum but I enjoyed scrolling down below the review and being able to read some comments directly about the product and character. I agree. I prefer comments to a full on forum. I got this guy yesterday...I gotta say, I really dig him. You don't get a lot of primarily white figures, and that plus the black really makes him pop (although I am terrified of him ever getting dusty or dirty, because it will never come off).